Image Credit: Chrystian Guy / Flickr. This image has been modified. What About Extra Virgin Olive Oil? Studies that have suggested endothelial benefits after olive oil consumption have measured something different: ischemia-induced dilation as opposed to flow-mediated dilation. There’s just not good evidence that’s actually an accurate index of endothelial function, which is what predicts heart disease. Hundreds of studies have shown that the ischemia-induced dilation test can give a false negative result. Other oils have also been shown to have deleterious results on endothelial function. A significant and constant decrease in endothelial function appears within three hours after each meal, independent of the type of oil and whether the oil was fresh or deep fried. Olive oil may be better than omega-6-rich oils or saturated fats, but it still showed adverse effects. This was the case with regular, refined olive oil. But what about extra-virgin olive oil? 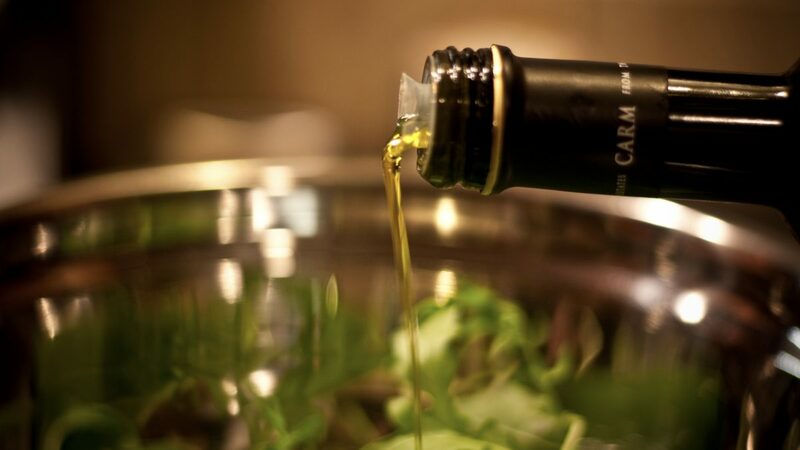 Extra-virgin olive oil retains a fraction of the anti-inflammatory phytonutrients found in the olive fruit, and so doesn’t appear to induce the spike in inflammatory markers caused by regular olive oil. What does that mean for our arteries? Extra-virgin olive oil may have more of a neutral effect compared to butter, which exerted a noxious effect that lasted for up to six hours—basically right up until our next meal. In the largest prospective study ever to assess the relationship between olive oil consumption and cardiac events like heart attacks, there was a suggestion that virgin olive oil may be better than regular olive oil, but neither was found to significantly reduce heart attack rates after controlling for healthy dietary behaviors like vegetable intake, which tends to go hand-in-hand with olive oil intake. There have also been studies showing that even extra-virgin olive oil, contrary to expectations, may significantly impair endothelial function. Why then do some studies suggest endothelial function improves on a Mediterranean diet, which is rich in olive oil? It may be because the Mediterranean diet is also rich in whole grains, fruits, vegetables, beans, and walnuts. Fruits and vegetables appear to provide some protection against the direct impairment of endothelial function produced by high-fat foods, including olive oil; therefore, improvements in health may be in spite of, rather than because of, the oil. In terms of their effects on post-meal endothelial function, the beneficial components of the Mediterranean diet may primarily be the antioxidant-rich foods, the vegetables, fruits, and their derivatives, such as balsamic vinegar. Adding some vegetables to a fatty meal may partially restore arterial functioning and blood flow. If olive oil can impair our arterial function, Why Was Heart Disease Rare in the Mediterranean? I’ve got a whole series of videos on the Mediterranean diet that I invite you to check out. Fatty Meals May Impair Artery Function so much that a single high-fat meal can trigger angina chest pain. But, whole-food sources of fat such as nuts appear to be the exception. See Extra Virgin Olive Oil vs. Nuts and Walnuts and Artery Function. I’ve also examined artery function with several other foods: eggs, dark chocolate, coffee, vinegar, tea, and plant-based diets.